I get a lot of questions about how big to make a grid. I remember, when I first started coaching, having this question myself. The image to the left is a general guide from US Soccer (click on it for a larger view). You should always make adjustments before or after the activity begins to fit the demands of your team. Great example grid. 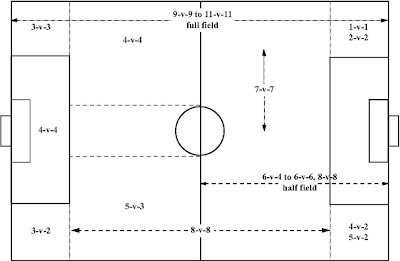 Field size is important for all different levels of play. I’ve had teams that cannot play in tight spaces, so the field had to be expanded. As the team progressed, the field size got smaller.